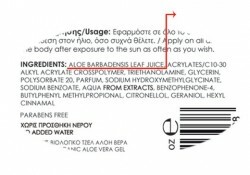 According to law, the order that the ingredients are listened on the back side of the label is based on the content of each ingredient in each product. 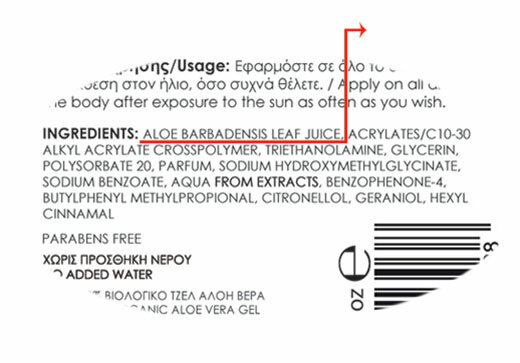 Οrganic Aloe vera gel is the first and basic ingredient in all products of Litinas Aloe. The very high concentration of Aloe vera gel is what makes our products market leaders. Airless bottles, airtightly secure and prevent the exposure of the products to enviromental conditions, the oxidation and finally the distortion of the ingredients which are more sensitive (reactives, vitamins, enzymes, etc.). With this way, we also keep the stability of the formula. In addition, with the isolation of the product in the airless bottle, we avoid its infection with microorganisms, which is the main reason that adversely affects the quality of the final product. Finally, airless bottles provide a controlled quantity of product, so that it can be used until the end without any waste of it. Aloe vera gel is a photosensitive product. Its rich, active and valuable ingredients could gradually be destroyed from light. Litinas Aloe΄s bottle* is special designed, certified according to the European regulation 1935/2004, suitable for food products with nil permeability to sunlight. Eleven stages of leaf processing, that provide the best quality. Quality control by professionals, from the plantation to the final product. For the production of our products we use only pure Aloe vera gel and not the whole leaves.